Brand new from WMS Gaming is this very nice-looking online slot called Frozen Inferno; the first thing you are required to do when loading up the game is to select which game mode you want to play – that of the Frozen Wizard or the Ice Wizard and this will determine the look of the game and one or two difference in gameplay. You can read all about it below. 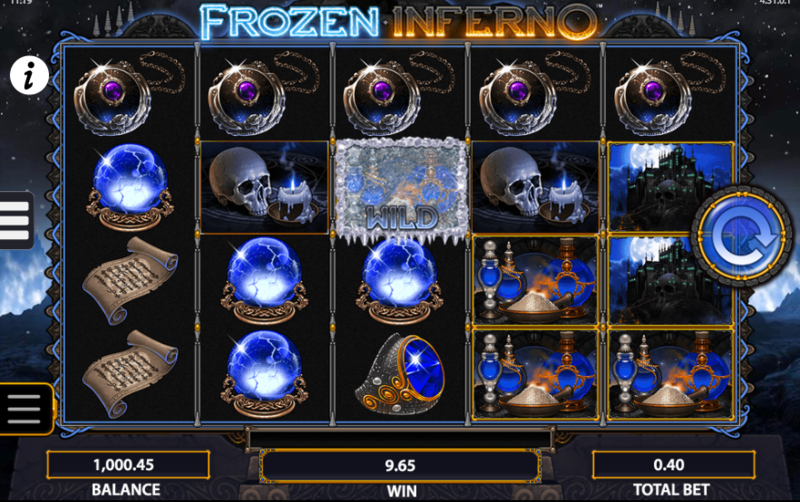 Frozen Inferno is a five reel slot with four rows and forty fixed paylines; depending on your gameplay selection you will see an icy, rocky wasteland behind the reels or a much hotter landscape underneath the star-filled night sky. The symbols for the Frozen & Inferno games are similar except they are either blue or red; they include glass vials, a skull/candle combo, a castle, a crystal ball, a sceptre, some runes, a ring, a necklace and a scroll. There’s also a stacked Frozen/Inferno wizard. The wild symbol is either a frozen frame or a fiery frame and the special symbols are ‘ice’ or ‘fire’ bonus icons. Frozen Wild – each ‘Ice’ symbol landing will transform into a another wild and freeze in place until four are on the reels; an Ice bonus symbol landing will then trigger the free spins round. Inferno Wild – the Fire wild will move around the reels one place at a time; another ‘Ride’ symbol landing will add another wild until there are four on the reels. 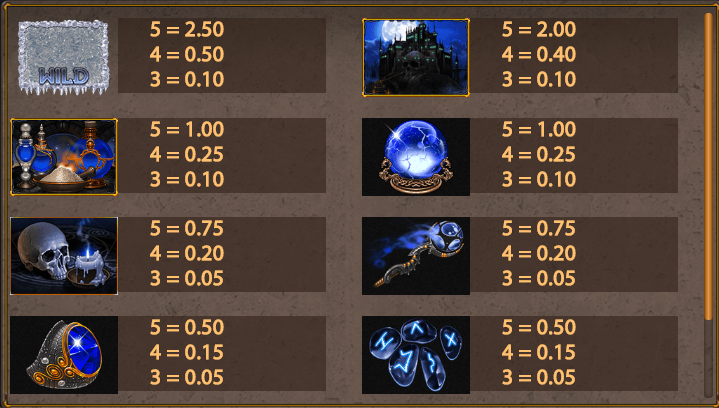 A Fire bonus symbol will then trigger the free spins. The free spins are triggered as described above and you will receive unlimited spins until five winning combos have been achieved. Each winning combo will change one reel from Frozen to Inferno and vice versa until the reel set is completely transformed and the round is over. We found Frozen Inferno to offer lots of potential once we’d understood the various rules and it’s the wild feature which makes things feel as if it’s one big bonus round. Play if for long enough and you’ll be almost guaranteed to trigger the free spins. It comes with an RTP of 96.36%.